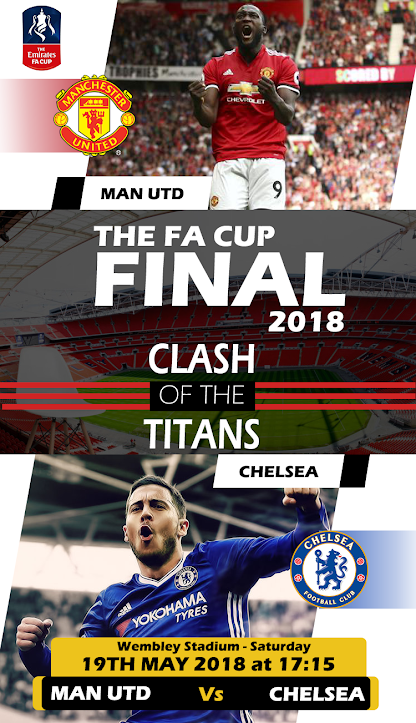 Chelsea face Manchester United in the 2018 FA Cup final on Saturday aiming to finish off a largely disappointing campaign on a high note. The Blues have struggled to replicate the form they showed during their title-winning success in 2016/17 and the final could well be manager Antonio Conte’s last game in charge of the club. Conte has almost a full squad to choose from, with just David Luiz and Danny Drinkwater on the sidelines, while United are sweating on the fitness of striker Romelu Lukaku. United are priced at 4/5 to win the FA Cup, with Chelsea just behind in the betting at Evens. The Blues needed a replay to defeat Norwich City in the third round, but they beat Newcastle United, Hull City and Leicester City at the first time of asking to progress to the last four. Olivier Giroud and Alvaro Morata got the goals as the Blues beat Southampton 2-0 to book their place in the final. Mourinho’s side breezed into the semi-finals of the competition, defeating Derby County, Yeovil Town, Huddersfield Town and Brighton & Hove Albion without conceding a goal. Goals by Alexis Sanchez and Andre Herrara helped United recover from 1-0 down to see off Tottenham Hotspur to reach a record 29th major domestic cup final. Cheap Chelsea tickets were in short supply ahead of last year’s final as the club looked to complete the double, but Arsenal upset the odds with a 2-1 victory. The London club are chasing an eighth FA Cup triumph this year, with their most recent win coming in 2011/12 when they defeated Liverpool. United last lifted the FA Cup in 2016 when they beat Crystal Palace 2-1 after extra-time and they built on that last season by winning both the EFL Cup and the Europa League. The two sides’ most recent meeting came at Old Trafford back in February when goals by Lukaku and Jesse Lingard gave United a deserved 2-1 victory. Willian had given the Blues a first-half lead when he finished off a flowing move, but the Red Devils recovered in style after the break to take the points. That result was Chelsea’s second defeat in their last 15 meetings with United in all competitions, although those results have come in the three most recent matches. With Conte looking almost certain to leave Chelsea this summer he would undoubtedly love to depart with an FA Cup triumph under his belt, but United are expected to put up stiff resistance this weekend. There is likely to be little to choose between the two sides and odds of 9/2 for either team to win on penalties looks a solid wager.